• Seal Kit consists of item 4,6,7,9 , 10,11,12, 13 ,& 14 for single solenoid vlave. • Seal kit consists of items 4,6,7,9,10,11,12,13, 14 & 16, for double solenoid valve. Working pressure 1.5 - 10 Kg./sq. cm. at 5 Bar On time : 35 ms.
OIf time : 45 ins. construction assembled with brass adapter. * Poppet vlave is also offered with flame-proof coil duty certified by CMRS Dhanbad for grades I,IIA, IIB, Refer data sheet PMV-07 for details. Seal kit consists of items 4,6,7,8,9,10,& 11, for single pilot valve. 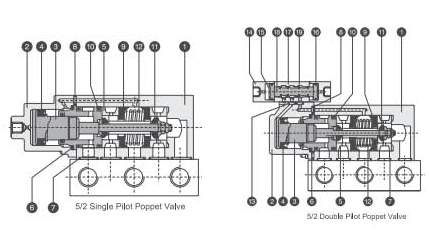 Seal kit consists of items 4,6,7,8,9,10,11, 16, & (17+19 ) for double pilot valve. Working pressure 1.5 -10 Kg./sq. cm. Ambient / fluid temp -10° to 85° C.
Response time On time : 35 ms.
at 5 Bar Materials Off time : 45 ms.